Polaroid's second 7" Android tablet hit the market about 2 weeks ago and I got it the morning it was available. This is a rather ordinary black slab of a tablet with a 7" capacitive touchscreen, 4GB Flash storage, microSD card slot, g-sensor, speaker/mike, and a TV out port (no cable is included). It's running Android 2.3 Gingerbread on a 1GHz CPU. 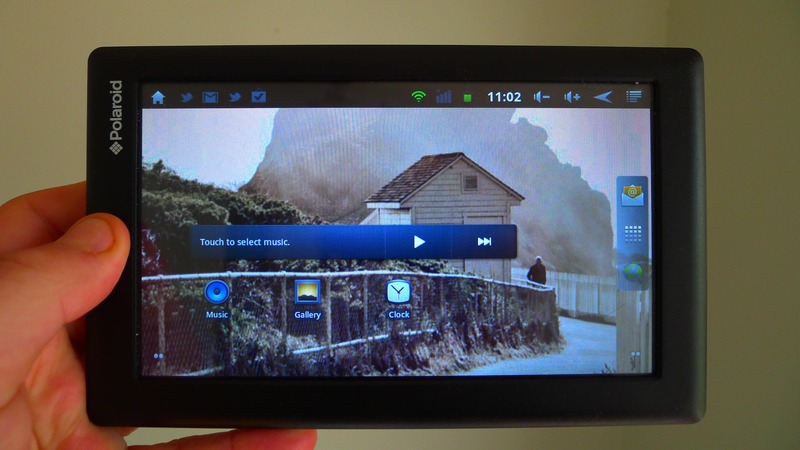 Update: There's now a later version of this tablet with Android 4.0. The hardware is the same and the hack works fine. It doesn't have Bluetooth or a camera, which puts it solidly mid-field for $99 tablets. The speaker is on the back, with the microphone alone on the one long side. All the ports and slots are found on the upper short side, with the power, home, back, and menu are on the right edge. The general build quality is good. The screen is responsive, and I had a minimal number of miss-touches. The PMID701 comes with a good suite of apps, including the Kobo app, but it doesn't come with Google Play or the Amazon app store. That puts it at something of a disadvantage when compared to the other good budget tablets like the IdolPad ($99, 7", ships with Google Play). I really wasn't happy with the apps that came on the device; the Twitter and email apps were rather poor. Luckily for me there's a hack which makes it possible to install Google Play. That radically changes my opinion of this tablet, making it one of the better ones in this price range. Angry Birds loaded and played just fine. So did the Youtube app, which loaded several clips and played them without trouble.The stock media player is worth replacing, but it played video files without dropping frames. Audio was quiet and missed some of the subtleties, but it worked adequately (this is a budget tablet after all). If you get this tablet, don't expect it to be more than a basic tablet. But as a basic tablet it is a decent one. I have found that the only place where it comes up short is in the hardware it lacks. It has no volume buttons. I know that is a strange complaint, but a lot of reading apps (including Aldiko, Kindle, etc) now use the volume buttons as page turn buttons. That makes it a lot easier to use a tablet to read on. And this isn't limited to just reading apps; some of the feed readers and aggregators also use the volume buttons in clever ways. All in all, this tablet is as good as the IdolPad, another $99 Android tablet. I didn't get a chance to take this tablet on a trip, which is my preferred way to test the battery life. But I have been using it as my main tablet for these past 2 weeks.I didn't have any issues with the battery mysteriously draining (like on some other cheap tablets). I would estimate that the battery lasted at least a day under moderate use. That is fairly good for budget tablet, considering that a premium tablet like my 7" Samsung GTab has only 2 days battery life under similar usage. I just bought a Polaroid PMID701 for $99. Your description was very accurate about what it has and what it lacks. This tablet is very basic, but it is my first introduction into the tablet community. On mine, I get about 4 hours or so between battery charges. I’ve had no problems with its Wi-fi performance. In my house, Wi-fi drops off in the same spots that my laptop does. I did install a 16G mico SD card init to expand the memory (as recommended in the istructions). I was surprised that such a feature was offered given the price. I do have some problems with access to some web-sites. But I feel that the problem is with the Android 2.3 (Gingerbread) operating system and not the device itself. I think that I’m just going to leave this tablet as is and use it for practice. Later [if I still like the tablet idea] I’ll upgrade to something else. So far, the Polaroid PMID701 is serving very nicely as a tablet introduction and practice tool. If you bought this 2.3 Honeycomb version of the 701 on April 8th 2012, you got took, because the Android 4.0 ICS version is on the market as of April 20th 2012 at a few places for only $99.99!! It only has 512MB of RAM, 4GB Mem and disappointingly no GPS, and no “Video Cable” (don’t even know Which one will work). It’s not a bad unit, pretty cheapy compared to my ASUS TF101A w/ Keyboard, but not a 3rd unit after my Samsung Android Cell. Incidentally, your Hack to add Google Market (Vending), Talk and SetupWizard, all installed fine on the ICS version, but GoogleServicesFramework-signed is not needed since it is already on the Polaroid 701i. And you are right, having Google Android Market (Play) make this Polaroid “acceptable”, because Amazon AppStore is crap. I could never use it because it refused to download apps, even though I already have an Amazon account 1-Click authorized!! I blame the Polaroid for this bug, because the Amazon Store app works on my ASUS TF101 … tough I never get any apps anymore from Amazon, except a few eBooks and AudioBooks. My main critique of this 7″ budget Tab is that I can understand no camera ($$$$), but I really don’t like the lack of GPS (that chip is an extra $0.75 at time of manufacture) and no Mini HDMI! Your 2.3 Andoid old model has a decent 1GB of RAM, this one with only 512mb was a dumb cheap-skate move. At least they put a Micro USB 2 port on it. Hate the edge buttons, too damn easy to accidentally push. Lastly, this PLASTIC screen worries me a lot, rather have a hardened Glass one, I know Gorilla Glass is too expensive for a cheapy 7″ Android Tab . If this Tab weren’t $99.99 at Big Lots, I’d never buy it. I also have the later tablet (I got it the 14th). The earlier tablet actually has the slight edge because 2.3 requires less system resources to run. Angry Birds ran slightly faster. Thanks for reminding me that I forgot to update this post. I bought the 701i (ICS version) yesterday and I’m already planning on returning it. At first I thought it would be an acceptable more “portable” alternate to the ASUS 10.1″ Transformer TF101A I already have, but after just a day of hacking it with even adding Google Market to it and trying to add what I consider MINIMUM usability apps which WON’T install because they are “Incompatible” …. I and taking this POS back to Big Lots. Here’s why: Aside from the sad fact it has no GPS or Bluetooth module, MOST essential Google Android apps are incompatible! No – Google Maps, Navigator, Voice Search, Talk is kludged on it, so is Documents. Other essential (to me) non-Google apps fail the compatibility test, like Inrix Traffic, Polaris Office or video players like MX Player and Mobo Player sputter and stutter trying to play any movie. This crashes constantly, it reset itself twice in 24 hours of testing and battery life at 4 hours is unacceptable. For being an Andoid ICS device, it’s deplorable, and hardly Android compatible. The 512mb of RAM is just not enough, it’s TOO SLOW! You’ll eat up the 4MB of Mem in nothing flat with apps and data. When i installed a 8GB MicroSD Card (Class6 Kingston), it started acting flaky. At some point the “Home” soft-button on the screen stopped working, and only the menu hard button works! My wife’s little 3.5″ Phillips GoMobile Android 2.3 device (8GB Mem, 1GB RAM) is ten times better than this POS. It will even play movies without Sputter and Cashing off our home wireless NAS! WARNING!! – if you’re looking for a cheap Andoid Tab in any size, this one is NOT acceptable! It is essentially a Phony Android which barely operates as an Android device; I’d rather wait and save up another $150 over this $99.99 price for a Samsung 7″ galaxy or wait for the 7″ ASUS Icona to drop below $250! Just my 2 Cents from a 2+ year Android Device user, 26 years in IT. Webster, you are a know-nothing idiot. The fact that you think GPS and a Camera is even desirable on tablet shows how much of a utter loser you are. What do you plan to stare at the screen as you walk in front of incoming traffic? That act would prove the gene pool a great though. And what exactly are those “Valuable essential Google certified apps” Crapola apps designed with *CELL PHONES AND EXPENSIVE 3 AND 4 G* DATA PLANS*in mind? Another thing which makes this tablet great is that it is a Allwinner A10 based tablet. This means that the source code for the kernel and video drives are GPL-Licensed and in fact can be downloaed. You go ahead and waste money on overpriced unexpandable toy devices like the Samsung Galaxy Tablet and those like them like the Xoom and the Ipad. I rather buy a something that’s actually useful like a laptop and a cheap tablet like the polaroid one with my money. PS. If you look at the Big Lots advertisement for the week of April 22nd, they either have a Typo or Flat Out Lied about the Specs on this Polaroid. It clearly says it has a 1MB RAM, which of course it DOES NOT!! It is only 512mb. I pointed this out to the manager at the Big Lots, and she obviously couldn’t care less…. or maybe she didn’t understand since English was not her first language. Anyway, this Polaroid is clearly a big piece of s&!t and I am so glad I returned it. As an “Android” device, it is a kludged con. The hardware is a joke – 512mb RAM, no cam, no compass, no GPS, a flakey kludged install of ICS which reset on my twice in TWO DAYS!. It can’t run valuable essential Google certified apps even with Google (play) Market hacked onto it. I’m buying a Samsung Galaxy Plus 7.0 WITH ICS already on it for $249 on Amazon. It will run everything and has ALL the hardware the Polaroid cheaped out on and it won’t be a Kludged POS like the Polaroid. I think you expected too much from a $99 tablet. I like the tablet for its size and features for the price but I cant hack the play store for the life of me no mater what sugg I follow on here it say sorry and closes. Anybody have any sugg? I really would like to watch Netflix at least on this thing if anything at all. I tried all that is posted here to no avail sorry have to close. Any help would be deeply appreciated. I don’t know whether that model is better. This is the first I’d heard of it. Can I ask where you bought it? It’s a little bit different from the 701 models. It uses a Rockchip processor instead of the Allwinner A10. Also, it has a camera for video chat. When it came out, it was being sold at Target for $139.99. I haven’t heard if the usual fixes will work on the 703 or not. The 702 has a camera. It was disappointing.